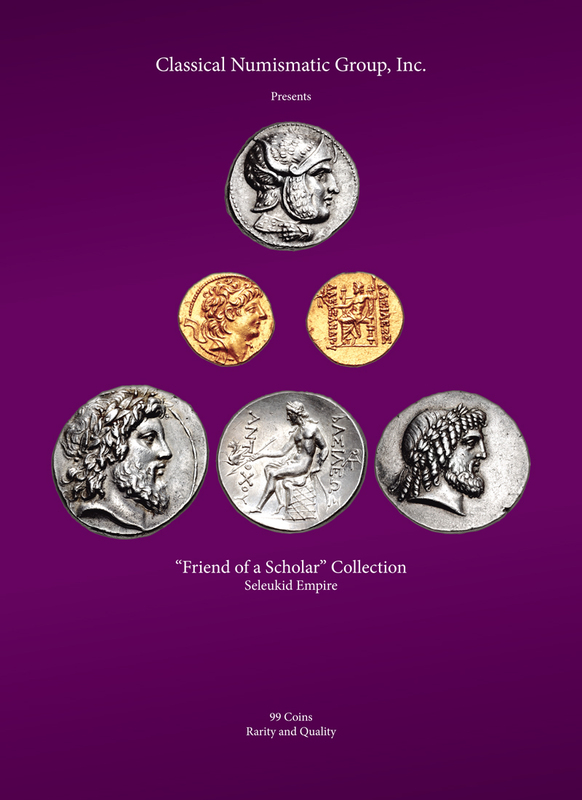 Classical Numismatic Group is pleased to present the Seleukid coins from the “Friend of a Scholar” collection intact, and as a single lot, containing 99 coins with an emphasis on great rarity and quality. The formation of the “Friend” Seleukid collection began in September of 1981, when he purchased a large group of Seleukid coinage from the distinguished Parisian firm of Maison Platt. Michel Kampmann of Maison Platt was instrumental in guiding our collector with his numismatic purchases, and acted as his main advisor for many years. The numismatic mentor of our “Friend” was Georges Le Rider, the great Hellenistic scholar, and former director of the Cabinet des Médailles at the Bibliothèque Nationale in Paris, as well as the Deputy Director of the Bibliothèque Nationale itself from 1975-1981. As a result, the “Friend of a Scholar” collection is included in many of Le Rider’s die studies as well as those of other important Seleukid scholars. Coins were added to the “Friend” Seleukid collection primarily through auction purchases, where he was active from the 1980s through the first decade of this century, from such auction houses as Baldwin’s, Bank Leu, Harlan J. Berk, Ltd., Claude Burgan, Classical Numismatic Group, Inc., Giessener Münzhandlung (Gorny & Mosch), Münzen und Medaillen AG, Münzen und Medaillen GmbH, Numismatica Ars Classica NAC AG, Numismatic Fine Arts, Inc., Numismatica Genevensis SA, Numismatik Lanz München, Dr. Busso Peus Nachf., and Jean Vinchon. An emphasis was placed on pedigreed and well-provenanced coins, and some of the most important collections since the late 19th century are represented, including the Abramowitz Family Collection, Burton Y. Berry, Major-General Haughton, Arthur Houghton, Nelson Bunker Hunt, Count Alessandro Magnaguti, Walter Niggeler, and the John Ward Collection (Metropolitan Museum of Art). With only 99 coins, almost every one is a highlight, but some of the more important coins in this collection are the Seleukos I tetradrachm with the horned horse head on the obverse and standing elephant on the reverse (SC 1.1), a choice Susa mint “Hero and trophy” tetradrachm (SC 173.11), and the discovery coin for the Seleukos I tetradrachm with Herakles/Alexander the Great on horseback types (SC 203). A tetradrachm of Antiochos I featuring a horned and diademed head of Seleukos I on the obverse and a horned horse’s head on the reverse (SC 322) is also included in the “Friend” collection. Tetradrachms of Antiochos II Theos (SC 607a and SC 501), Antiochos Hierax (SC 875.3 var. and SC 907c), Antiochos III Megas (SC 1067), Seleukos IV (SC 1329.2b), and Antiochos, son of Seleukos IV (SC 1369a and SC 1370 [drachm]) are featured in the collection. Two of the more important and artistic highlights are the issues of Antiochos IV that feature beautifully engraved portraits of Zeus and Apollo on the obverse (SC 1398 and SC 1401). Another masterfully engraved rendition of Zeus is featured on a tetradrachm of Alexander I Balas (SC 1798). A tetradrachm of Alexander I Balas and Kleopatra Thea from the Ptolemaïs mint (SC 1841) is included in the collection, as is a Tarsos mint tetradrachm of Antiochos VI Dionysos with a Sandan on altar reverse (SC 1996)–one of only two known. The usurper Tryphon is represented by two tetradrachms (SC 2037 and SC 2046.2c) and a drachm (SC 2033d), and Demetrios II Nikator’s coinage is highlighted by a tetradrachm from the Tarsos mint (SC 2156.3). One of the great rarities in the Seleukid series is the silver tetradrachm of Kleopatra Thea from her brief sole reign (SC 2258.2), which is represented by a choice example that first appeared in the Spink COINEX 2003 sale. A joint rule tetradrachm of Kleopatra Thea and her son Antiochos VIII from the Damaskos mint is also included (SC 2267.1 var.). A Tarsos mint Sandan on altar tetradrachm for Antiochos VIII is featured (SC 2288.1b), as is a Damaskos tetradrachm of Antiochos IX Kyzikenos (SC 2381.1). An extremely rare tetradrachm issued for Seleukos VI at the Seleukeia on the Kalykadnos mint (SC 2405.8) is part of the “Friend” collection, as is the unique joint rule tetradrachm of Antiochos XI and his brother Philip I Philadelphos (SC 2438). Finally, the “Friend of a Scholar Collection” of Seleukid coinage includes important gold staters for Antiochos I Soter (SC 435.3), Antiochos II Theos (SC 617), Seleukos II Kallinikos (SC 701 and SC 786), Demetrios I Soter (SC 1724–unique stater from the Ekbatana mint), and the unique stater of Alexander II Zabinas from Antioch on the Orontes (SC 2216). This collection is offered in its entirety.